Before 2015, the Chevrolet Camaro had beaten the Ford Mustang in the annual muscle car sales race each of the past 5 years, staring with the arrival of the 5th gen Camaro late in 2009. While the Camaro comfortably won the annual bestselling muscle car title from 2010-2014, the Mustang managed to win a month here or there each year so while the Ford lost the annual war in each of the past 5 years, the Mustang still won some of the monthly battles. 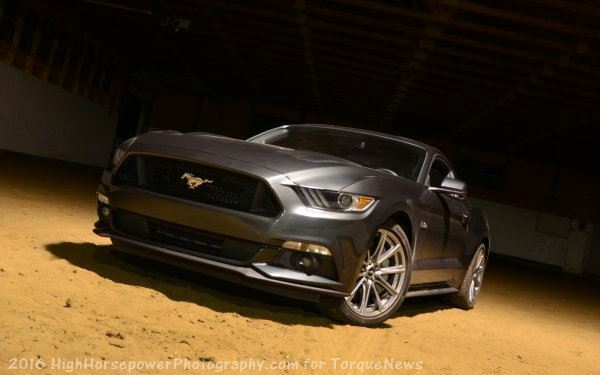 On the other hand, the 2015 Ford Mustang has posted such strong numbers since going on sale late last year that the Camaro and Dodge Challenger were not able to beat the Mustang a single time during 2015 so in claiming the title for the bestselling sporty car and bestselling muscle car in America for 2015 – the new Mustang did so in punishing fashion. The Ford Mustang made short work of the Chevrolet Camaro and the Dodge Challenger early in the year due to the high demand for the new models, but we expected that Mustang sales would fade later in the year. The numbers dipped a bit from the early spring, but with more than 25,000 Mustangs sold in the final three months of the year, Ford didn’t see much drop in sales throughout the entire year. At the same time that the Mustang was flying off of the shelves, prospective Chevrolet Camaro buyers were patiently waiting for the arrival of the 6th generation, 2016 Camaro. The new Camaro was introduced this summer, which caused a slow in Camaro sales, but as we got closer to the November dealership debut of the new Chevy muscle car, Camaro sales continued to be very bad. All along, we had expected that the arrival of the 2016 Camaro at dealers around the country would lead to a late year spike in sales for the sporty Chevy and with the spike in sales would come a real challenge for the Mustang. Unfortunately for GM and their fans, with only 5,366 Camaros sold last month, that new model spike didn’t come soon enough to prevent the Camaro from being shutout on the year. In the end, 2015 was officially the worst sales year for the Camaro since being introduced late in 2009 and as a result, the Mustang beat the Camaro in annual sales by more than 44,000 units. The Ford Mustang is officially the bestselling muscle car and the bestselling sporty car sold in America with a total of 122,349 Mustangs sold during the calendar year. That figure is a bit short of the next best year, which came in 2007 when Ford sold 134,626 Mustang coupes and convertibles. In quickly looking through historic Camaro sales, it looks like Ford’s total for 2015 is more than any year for the Camaro dating back to the mid-1980s. The Chevrolet Camaro had the worst year of the 5th generation, but GM still managed to come in second in annual muscle car and sporty car sales with 77,502 units sold. The next worst year for the modern Camaro came in 2013 when GM only sold 80,567 Camaros while the best year for the modern Camaro came in 2011, when GM sold 88,249 examples of the Camaro. The Dodge Challenger finished third in muscle car and sporty car sales with 51,462 units sold during 2015. This is a big drop from the Camaro and Mustang, but with 2015 being the best sales year ever for the Challenger, the folks at the Chrysler Group are perfectly happy with their muscle car sales totals. There is no question that the Ford Mustang was the favorite American muscle car for 2015, beating the competition from Chevrolet and Dodge in each and every month of the year. We can expect to see Mustang sales numbers drop through 2016, but for the Camaro to win the 2016 title, GM needs to post sales numbers unseen in almost 30 years or they need the Mustang to really see sales rates slow. Mustangs are nice but GM was still selling their 5th Gen while Ford had a new release. Not quite apples to apples. From the article: "The new Camaro was introduced this summer, which caused a slow in Camaro sales, but as we got closer to the November dealership debut of the new Chevy muscle car, Camaro sales continued to be very bad.". So even the 6th gen sales didn't help any. It didn't come out until September. For 2016 it's a no Brainer as far as performance goes. The 15' mustang and 16' camaros are no longer muscle cars.....there now sports cars. I think of them in the same category as an M3. Dodge is really the only manufacturer STILL making a "muscle" car as of now.